Clifford was my tech and he did an awesome job. He explained things clearly, and most importantly, was able to get our thermostat and air conditioner to talk with each other. Great, thorough job! The final install was better than they said it would be. They were on time and responsive to all questions, and did not care if they were watched or questioned. The office was immediately responsive to after install needs. The final inspections were arranged and accomplished in short time. I would recommend them to relatives and friends; which is not my style. The technicians from Now were extremely polite and conscientious. I feel very comfortable that the job was done right and that any maintenance and follow-up will be done the same. This has been an excellent experience for us from start to finish. Abram did an excellent job with the quote, Rod and Charles were wonderful. I have never seen anyone get in, and get the job done as quickly and efficiently as they did and Ian and his partner were very efficient doing the testing of the system and very personable.. These guys did a great job, especially working through a late spring snow storm! The system works perfectly and kept me nice and cool this summer and nice and warm this winter! I live in the foothills above Denver, so there's a mountainous drive just to get to my house. The crew arrived when they said they would, worked a long day and showed up the following day when they said they would, even after having to pick up some other needed parts. The two-man crew was polite, professional and knowledgeable - explaining to me some of the complicating factors and how they plan to overcome those challenges. Well done! My install went off without a hitch except that I was told it would only take one day but, in fact, it took two. Otherwise it was a great experience. My heater went out today so I called Now Heating and Air, and I was happy to have Ian T. come by on short notice. He was polite and informative. I felt as though he actually cared for my situation and not trying to force a sale. I am happy with this company and its services, and will feel safe to call them next time. Ian was very professional and friendly. Cleaned and put in new filter for the year. explained things in detail. The technicians were on time and very professional. I hope that this new furnace will last me a long, long time as I was reluctant to replace my old one because of the cost. They mentioned something about a rebate from Xcel Energy but didn't give me any details. From the first call to Now, the lady who answered the phone was very friendly and professional. She told me I would receive a call back in an hour, and I did. The employees are very knowledgeable and professional. The installer of my a/c unit was very polite and professional. I am very happy with the service I received from the first call. Excellent company. Ian was real friendly and know what to do. He expand about the furnace and clean my furnace. Ian was professional and helpful. He recommended and explained things. Very pleasant! Ian T. was a savior. He programmed our new Nexia thermostat ( Saturday) to control our new furnace and air conditioning system. Very kind, patient and knowledgeable! Thank you Ian!!!! 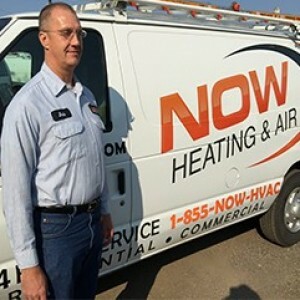 We have had Now Heating for a couple of years and we are very pleased with their service. They send us an e-mail twice a year for our yearly maintenance and then they do a follow up call to remind us of our appointment. Ian Thoele came to do our maintenance and he recommended we install a humidifier but we declined. He did make a suggestion for water alarms which we did purchase. He showed me how easy they are to use so we bought 4 of them. Ian was very attentive to details and had the courtesy to call with his ETA. He has serviced our equipment for several years and always delivers the work in a professional and efficient manner.